Tuberculosis (TB) is one of the most important public health problems in Tanzania and was declared as a national public health emergency in 2006. Community and individual knowledge and perceptions are critical factors in the control of the disease. 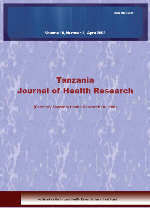 The objective of this study was to analyze the knowledge and perception on the transmission of TB in Tanzania. Multinomial Logistic Regression analysis was considered in order to quantify the impact of knowledge and perception on TB. The data used was adopted as secondary data from larger national survey 2007-08 Tanzania HIV/AIDS and Malaria Indicator Survey. The findings across groups revealed that knowledge on TB transmission increased with an increase in age and level of education. People in rural areas had less knowledge regarding tuberculosis transmission compared to urban areas [OR=0.7]. People with the access to radio [OR=1.7] were more knowledgeable on tuberculosis transmission compared to those who did not have access to radio. People who did not have telephone [OR=0.6] were less knowledgeable on tuberculosis route of transmission compared to those who had telephone. The findings showed that socio-demographic factors such as age, education, place of residence and owning telephone or radio varied systematically with knowledge on tuberculosis transmission.